The Atlanta downtown library has some elements in common with the Des Moines central branch. It performs better is some areas and worse in others. Fundamentally, however, they have the same approach to housing books: keep the sunlight out. I'm not an archivist, but I assume this is sound science. Site Placement. The Atlanta public library covers an entire (small) city block. It is set up from the street level by about a half story on average. The Des Moines central branch occupies half of a large city block, and backs up to (or fronts depending on which way you approach) a grassy plaza. Atlanta Public Library Main EntrancePedestrian Access. 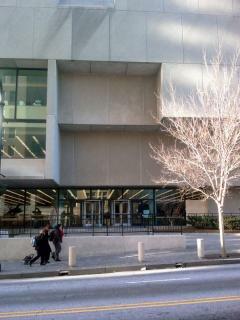 Despite its overbearing presence, the main entrance of the Atlanta library is obvious and pedestrian. The main facade was clearly designed to invite pedestrian access. However, there is only one way for a pedestrian to enter. The other three facades are blank, except for the delivery area in back). The Des Moines central branch has pedestrian entrances from every direction, yet ultimately I think, is less successful at announcing its intention as a pedestrian destination. Cladding. 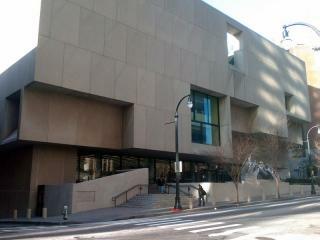 The Atlanta library is clad for the most part with blank concrete and limestone(?) walls. The Des Moines library does so with a more technological glazing system, but the outside effect is the same: a pedestrian has no relationship with the interior activities. As an urban building, the Atlanta downtown library is slightly better behaved. It should have pedestrian access from multiple sides and there should not be entire blank walls. Yet perhaps the brutal nature of the design and materiality can be accepted as a function of the era in which it was built. It is located at the transition point in downtown Atlanta between the historic section, where many older buildings remain, and the oppressive post-60's highrise section (where my conference is located). Breuer himself came out of the Bauhaus and was a pioneer in the transition between the International Style (think Ludwig Mies van der Rohe, Walter Gropius, and le Corbusier) and Brutalism (of which Louis Kahn was a more sensitive practitioner in my opinion - try this library on for size). Perhaps as well the Des Moines central branch can be evaluated as a function of the time in which it was built - the dawn of the "green" architecture era when architects were exploring technical and design features with a focus on energy efficiency to the detriment of pedestrian connection and urbanity. On the other hand, we know that encouraging pedestrian use and moderate density are integral parts of sustainable design in urban areas.